Jean-Christophe Bouvet ... Jean-Paul Martoni, le député du R.E.P.N. and make us laugh as well. Talk about 'mise en abime'. with an interrogation mark. This opening is like the first cartoon in "Who Framed Roger Rabbit", it wins us, as we're excited to see what's coming next and it sets the tone of the film, it's about the world of cinema. Even the victims of the killer who looks like "Red" from the film are the projectors of the film. This is not just "Les Nuls"' film, it's a film's film. we pity Kansas City" or Chabat telling his co-anchor "Penelope, is that a tampon on your ear" her answers is "Oh. Where the hell did I put my pen?" This humor was often branded as "Canal +" spirit, the young and free-spirited channel (it wouldn't last), created in 1984, launched the career of many famous French comedians "The Nuls" were the first and most emblematic. There were Alain Chabat, Chantal Lauby, Dominique Farrugia and Bruno Carrete, the only one who doesn't star in the film as he passed away 5 years before of a devastating virus caught in some trip in Egypt. His friends paid tribute to Carrete by inserting some footage in a news report. Out of the remaining trio, Alain Chabat would live the most successful career, that would pinnacle 8 years later, by directing "Asterix: Mission Cleopatra", the second highest grossing movie at the time. And it says a lot that Chabat directed Asterix and made a big hit out of it. Indeed, even if 95% of the movies parodied in "City of Fear" are from the other side of the Atlantic, "Evil Dead", "Basic Instinct" or "Terminator", Chabat's main influence was the master of comic-book writing: René Goscinny, creator of Asterix and Lucky Luke and whose trademark was a form of parody humor with no holds barred for the sake of laughs, a very fun, lighthearted and not too controversial humor. Goscinny's specialty was characters who were both marvelously stupid and touching. 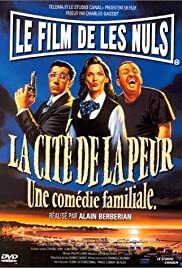 In "City of Fear", the film's star is Simon Jeremi, a guy who throws up whenever he's happy, he's like a mix of Averell Dalton and Rin Tin Can with a little touch from Alain Chabat. The film is very American-like but the comedic treatment of the story is much European. And this is why the film aged better than serious French films trying to look American. So, let's get to the story. Projectionists die whenever they project "Red is Dead", they're played by iconic character actor Tcheky Cario, classic legend Daniel Gelin, a pal, Jean-Pierre Bacri and former rocker-turned-actor Eddy Mitchell. To lead the investigation, there's an elegant charming police detective played with cool seriousness by Gérard Darmon. And there's Chabat as the bodyguard hired by Odile to protect Jeremi. And with that crazy joyful bunch, you just have one of the highest ratio of gags from any French film. It doesn't necessarily make it the funniest, but at least, it's the most consistent, and it never gets too shy on pushing a gag further and further. When, at the hotel, Jeremi declares he wants to eat pig's gums, it's funny already, but then Serge asks for a restaurant that serves pig's gum, and get an answer, Martinez, the best pig's gum in the city. There are bits of humor that would have made the Zucker Abrahams brothers and the Simpsons writers extremely proud, and what is so impressive is that the film, in that midst of hilarious gags, finds the time to tell us a story, with a beginning, an end, a climax and a resolution, and a fine musical number between Chabat and Darmon, that might give you a foretaste if you want to check on Youtube. It's called "La Carioca". As for "City of Fear", fear not to watch it, as it's first class A comedy made-in-France.